According to Bobcat, the two three-point soil conditioners are available in working widths of 60 and 72 inches. The soil conditioner is a useful tool for producing a perfect bed for seed or sod, windrowing and separating rocks or other ground debris, grading and leveling topsoil, removing old sod, or pulverizing clumps of dirt. The drum of the soil conditioner is powered by the rear PTO on the compact tractor or Toolcat 5610. Drum rotation is set for proper operation of the soil conditioner when the machine is traveling in the forward direction. Carbide-tipped teeth cultivate the ground to produce a smooth finish. Various cutting depths are available by adjusting the rear bolster wheels. 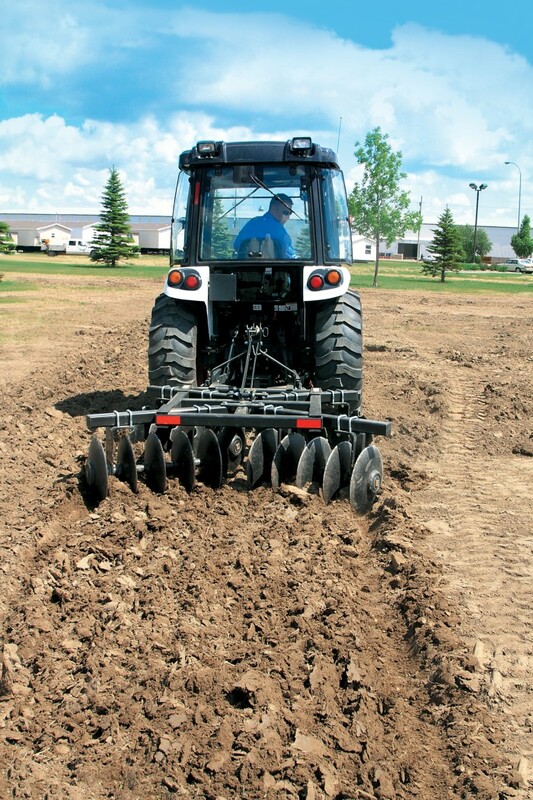 New Bobcat three-point disc harrows can easily break up the soil surface to prepare it for new seedbeds and plantings. Four sets, or “gangs,” of five 18-inch discs cultivate the soil and chop unwanted debris, such as weeds or old crops. These gangs are adjustable to provide different cutting depths and aggressions. The discs on the two front gangs are notched to assist in better ground penetration. This entry was posted in Heavy Equipments. Bookmark the permalink.